The Kerry Minors will play Monaghan in Croke Park next Sunday at 1.30pm in the Electric Ireland All Ireland Minor Football Semi Final. The game is a curtain raiser to the Senior Semi Final between Monaghan and Tyrone at 3.30pm. Tickets are on sale on gaa.ie/tickets, Centra & SuperValu outlets around the county as well as in the Kerry GAA Store, Killarney. Hogan Stand and Cusack Stand tickets are €45 and Terrace tickets are €30. We wish Peter Keane and all involved every success next Sunday. 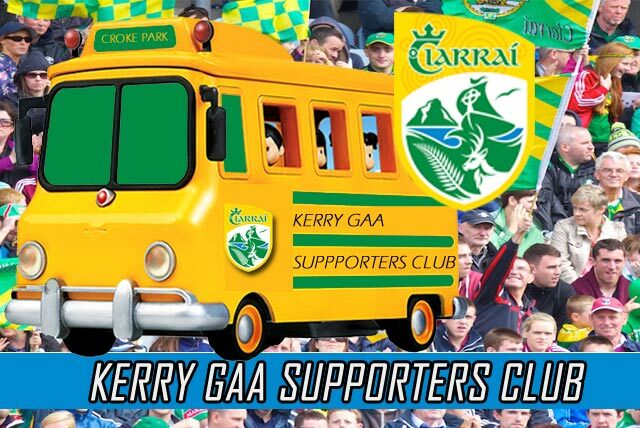 The Kerry Supporters Club will take a bus to Croke Park for the Minor Semi Final if sufficient numbers will travel. All seats must be booked by Thursday night. Travel times are Farranfore 7 O’Clock, Tralee 7.30, Listowel 8 O’Clock. For bookings contact Donal O’Leary, John King or Martin Leane.